When it comes to trick-or-treating, there's no such thing as too many treats. If possible (and if only parents would allow), wouldn't you want to pay a visit to every house and extort treats from the innocent family who lived there? Thankfully, there's now an app for reliving that dream - introducing Millie's Book of Tricks or Treats, Volume 2. Go trick-or-treating in Millie's neighborhood. Millie's Book of Tricks and Treats, Volume 2 is an interactive book app for children that stars an adorable three-year-old Havanese dog named Millie. The app is a spin-off of a series entitled Millie Was Here, which chronicles the cute canine's wacky adventures. First introduced last year to celebrate Halloween, the Books of Tricks and Treats app was expanded with a second volume that retains the same format while introducing new contents. In Millie's Book of Tricks and Treats, Volume 2, readers play pretend trick-or-treating in Millie's festively decorated neighborhood in hopes of a bountiful reward for the black and white furball. 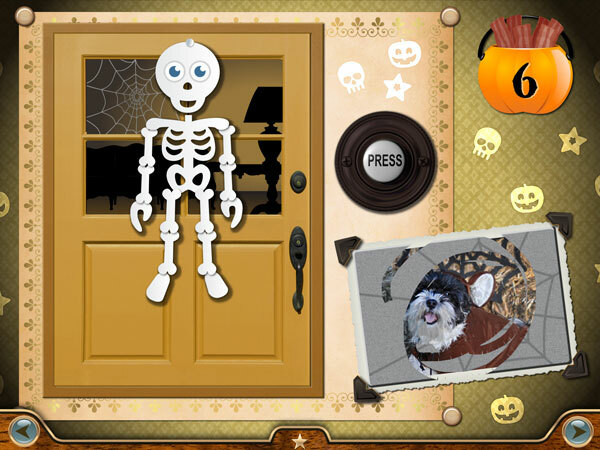 In each page of the app, you'll find a doorstep adorned with fancy wallpapers and Halloween-themed decors. After pressing the doorbell or knocking on the door three times, the door will swing open to reveal a spinning wheel of fortune that randomly lands on "trick" or "treat". A narrator will then read out a tall tale and a video will be shown in the doorway of Millie performing all sorts of silly stunts mostly involving her favorite treat: bacon. In addition to collecting treats (or tricks) for Millie, juniors are also enticed to tap on the screen to find collectible stickers of (cutesy) spooky creatures. At the bottom of the screen, there is a scratch-off card that can be smudged to reveal photographs of Millie in various Halloween costumes. Knock on the door or press the doorbell to see whether you earned a trick or a treat. You can also scratch off the card to see photos of Millie in fancy Halloween costumes. Millie's Books of Treats and Tricks, Volume 2 is a cute Halloween-themed app that will enchant your juniors with its lovely mascot. As a book app, it delights with humorous and dramatic narrations that are appropriate for juniors of all ages. However, due to the simplistic content and repetitive nature of the app, I would recommend this app for younger juniors, perhaps between two to four years old. The video content included in the app are nothing frightful (in fact, they are kind of silly) and are child-safe. It is also worth noting that while there are only ten doorsteps in Millie's neighborhood, the app actually contains over 40 videos that are randomized with every play. Interface-wise, the app is fairly easy to use with minimal guidance. Navigating between pages is done by tapping on the left or right button at the bottom of the page. Tapping on the Star button will reveal shortcuts for jumping to a specific page, your sticker collection, Help and Settings. Finally, the app also includes an interesting feature called Bedtime mode, which dims the screen and turns down the app's volume - perfect for bedtime. This mode can be turned on from the front page of the app. The door swings open to reveal a video of Millie performing silly stunts. Now here's an app that I think would be perfect for Halloween. Whether you are a child or an adult, it's easy to fall for Millie's adorable puppy looks and charms. Her deadpan expressions as she performs comical narrations are priceless and will likely cause your juniors to suddenly want a puppy. The tall tales videos themselves are humorous - I love how the developers used cheesy special effects and sound effects that are guaranteed to make you giggle. The fact that I get to see different videos every time I play the app is exciting and I eagerly knock on each door to know if I would score a treat or a trick. Last but not least, I appreciate the attention to details that are incorporated in designing the app's overall look and feel. I love how each house has a distinctive theme, much like real life houses would. The spooky-toned background song also creates a wonderful ambiance that perfectly complements the app's theme. Find and collect stickers of spooky creatures that are hidden in every page. Millie's Book of Tricks and Treats, Volume 2 is a great companion for your juniors this Halloween. This child-safe app is bound to make them giggle non-stop with an adorable canine and funny videos.